Big brakes & chassis braces @ 949Racing - Miata Turbo Forum - Boost cars, acquire cats. 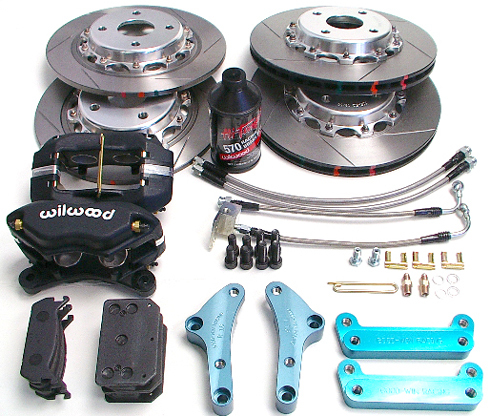 We are now offering the Goodwin Wilwood Big Brake kit. Our version of the kits will come with your choice of Carbotech pads. 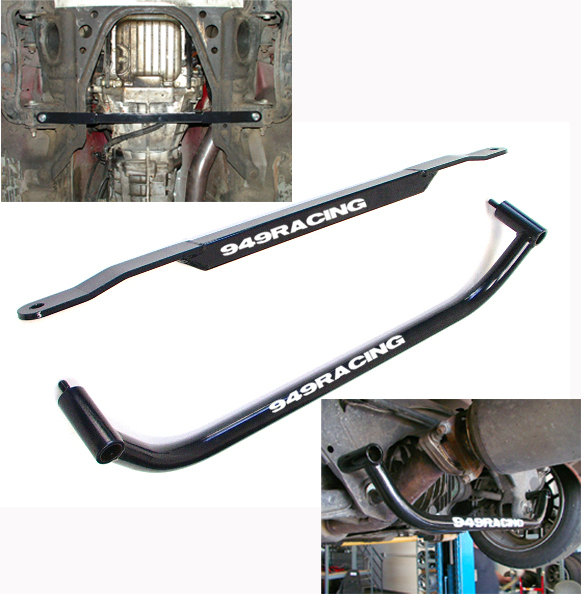 We're also including the Wilwood Quick Release pins to make pad swaps super quick and secure. We stumbled across a stash of the old Brainstorm subframe braces for the 90-05. They are a very clever design and feature top quality fabrication. Both braces are totally tucked in above the lowest point of the subframe. Super simple installation requires two box wrenches, that's it. I tried the Frog Arms on the OGK track day car and immediately noticed the difference in steering feel. I found in high G cornering, the steering would have a more linear response to inputs. I'd like to tell you they make it ride better but frankly I wouldn't know since the OGK has 700/400 springs and race tires. Last edited by emilio700; 12-04-2008 at 05:56 PM. Emilio,how much for the rear caliper brackets and what's the diameter size of the rotors? 11 & 10.75" Full details on the site. Whole kit or replacement friction rings only. how much are replacement rotors? With the 1521's your rotors should last just about forever. At the other end of the spectrum, say an instructor/advanced driver with 225/45 R compounds doing 2-3 track days a month and maybe one autocross running XP12/XP10, you might get a year and a half per front and probably over 2 years on the rears. Swap the Carbotech's out for rotor chewers like a Hawk or PFC and you'll be coming back for rotors 2-3x a year. 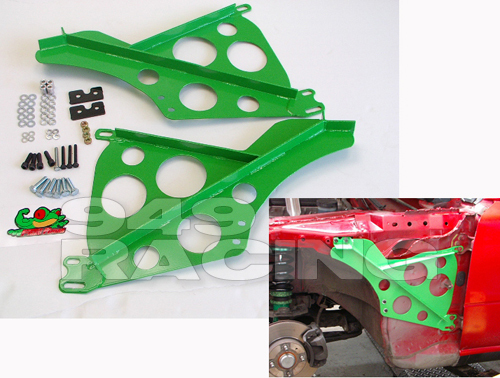 Are the subframe braces applicable to a 95 R Package car? I know Mazda added more bracing as the years went buy, but not the details. how long should I expect carbotech track pads to last when compared to hawk blues. I can get 3-hours of track time out of a set of blues. Depends on the compound. If you run any pad past its MOT, they wear far more rapidly. With Carbotechs, as with any other pad, the higher the friction, the faster they wear. From what I've seen, Blues last about as long as XP12. Rotor wear with Blue's is roughly 2-3x more rapid than what you'll get with XP12. The XP10 is about the same friction .cf as the Blue, wears longer and has about 60% higher MOT. In what brake system are you asking for the wear comparison with Hawk Blue? sport fronts, 1.8 rears. I can work with ducting too. Get some thermographic paint for your rotors. See if you are getting over 1000°. The more overworked the systems is, the smaller the difference in wear from a Blue to an XP10. Actually, looking at my data again I see the Carbotech AX6 autocross pad is a closer match to the Blue but still a higher MOT. I would expect AX6's to last about twice as long as Blue's. can I get away with running ax6 or xp8 on the street? I'd rather have some headway when it comes to heat range. I actually have several customers running XP12's on the street. Dusty but they don't eat rotors when cold and still stop very well even before they're heated up. Not recommending the XP12 to you specifically, just pointing out that worrying about cold rotor wear and cold stopping power are moot with any Carbotech. how do you compare the pads available with your kit with the wilwood "B" compound the kids like to run? and the Q street pads? I think I'm looking at higher heat ranges. I don't think its possibly to brake too much more aggressively than I am. If they don't eat rotors and stop "well-enough" on the street, I'll run em. Carbotech's are really expensive though, and that's turning me away. I was going through pads pretty fast at 94whp. I think with 250, I'm going to need the headroom. Seriously though, the Wilwoods are old school iron/carbon with metal fibers like the lower end Hawks. The same way race pads were made 30 years ago. With my first BBK on the turbo I tried all sort of pads including every single Wilwood including the discontinued J pad. First, they all ate rotors except the Q's. It was pretty much new rotors with every set of pads. If I was lazy enough to try to commute for a few days with the B's or J's, 2 rotors per pad. I got very proficient at ordering rotors :(. My biggest complaint was the widely varying friction and difficulty modulating, the B's in particular. For example, at Streets of Willow or California Speedway, the brakes would cool off enough on some sections to have very lackluster intial bite but would come up to temp halfway through the braking event, locking a wheel. In some zones they just wouldn't come up no matter what I did so I simply braked early and couldn't rotate the car because of the extreme front bias. In some turns this was killing any attempt at decent entry speed where I needed to trail brake and couldn't. ARGH. So I adapt by hammering the pedal in the next braking zone, assuming the pads were cold. Of course the pads are still in the meat of their friction curve so I immediately lock a tire. ARGH. This would vary with ambient temp and which tire I was running. It became another variable I'd have to adapt to for the few laps of the session. Remembering which braking zones they stayed hot enough to work in and what part of the friction curve they were in. For the braking zones where they cooled off, you simply putted in an got out braked by guys on street tires. ARGH. So I went on the quest to find proper pads for track use and eventually found the Carbotechs. Sort of an underground racer's secret for a long time but now most folks have at least heard of them. There's more data but that's essential background on my experience with Wilwood pads. The Q's are what I call hot rod pads. They're intended use is on a hot rod that doesn't actually get driven hard, very low friction, no noise, no dust, no MOT. I faded the set I tested on the street with street tires. I think for a novice driver on street tires using the Wilwood kit, they'll be OK. Brian says he doesn't have too many customers asking for more. Carbotechs are mainly ceramic Kevlar, very little metal or carbon. Your typical supercar OE pads are made with the same mix of materials. Brake pad tech evolved and these materials are simply more expensive. I could actually make great margin selling piles of Hawks & Wilwod pads. Instead, I make very modest margins selling far fewer Carbotechs. ok, I'll bite, as long as I get the life advantage out of the deal. However, I wonder if I could run the xp-12 on standard 1.8 brakes and live to tell about it. I have been running xp10s front and xp8s rear because i dont track as often as i wished. Savington, please discuss street-ability. I'm not opposed to a separate pad for the street and track. Sport brakes? I built this car to **** on the chest of exotics and rich people...so I drive the car as hard as it will go. I only drive it on the street when its nice out. Which compound is considered the "endurance" pad? Any reason why I shouldn't go with that one? Last edited by hustler; 11-15-2008 at 08:50 AM. I just put xp10's on the front to replace the 8's I wore out. In 40 degree rainy weather they are stopping fine cold. No "oh crap" moments at all with cold damp pads in the morning. If I hadn't worn the 8's to metal my rotors would have been fine. They really are pretty rotor friendly but they do dust like crazy. Emilio says the dust isn't as corrosive as others so that's a plus. I just need to find something that will help it wash off easier. I would guess the 12/10 set up could be the right one for you. For liability reasons I would guess Emilio can't really endorse a track pad for the street. Has anyone here used those Brainstorm braces? For about $100 bucks they seem worth a try but I don't need to throw away a hunsky if they are useless. If they help they are a bargain!! !